Max lost weight again with this hospital stay. He also lost some of his strength. So, I was wondering how he would do with his therapies as he got back into them. Last week, he just barely made it through each therapy before he was ready for a rest. 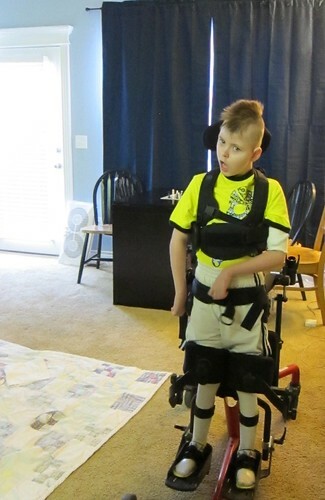 Today, not only did he make it through therapy, but he told me before hand that he wanted to stand up in his stander. 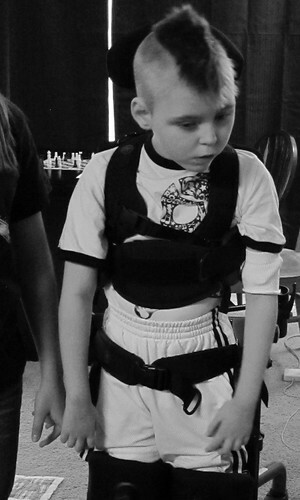 I expected that we would get his AFO's (therapy supports for his feet) on, and he'd be exhausted. But, not at all the case. We got him in his stander, and there he stood for 20 minutes. He wanted to stand longer, but his body was too tired, and he couldn't hold his head up on his own easily. When I told him I was going to sit him down since he was so tired, he gave me the sign for 'more' and started crying. 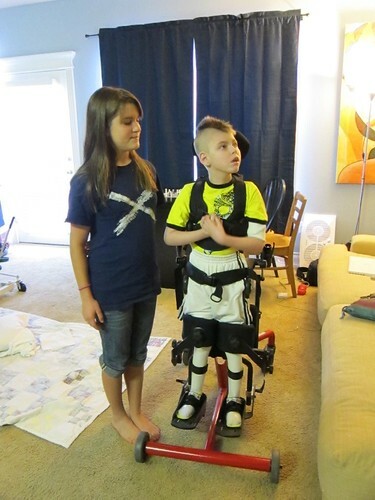 I guess we'll have to let him stand more and more...to keep getting STRONGER! He is tall! And I LOVE his hair! I really enjoyed all of the pictures you posted. I hope each day brings continued gains in strength. This is soooo...it was part of my dream last night, Deana! Max and I were visiting while you took a break and as I was holding him against my chest while he leaned against me he turned his head up and smiled. Then, a while later, he wanted to stand/walk with me holding his hands. We couldn't wait to show you and you were just amazed and we were all so happy and smiling. I tweeted you about it but then came here and found this post! Timing..............it sure is something. Holy moly! Catching up to sissy! And Abbey is no shorty!